Maryam Maquillage: Sun. Sky. Sand. Waves. Beach! Sun. Sky. Sand. Waves. Beach! Bonjour mes amis! Beach season is here and I'm feeling inspired by all the summery elements of my favorite past time: Beach Bummin'! My eye of the day isn't something that I'd actually wear to the beach (I much prefer no makeup and lots of SPF), but it is an artistic embodiment of all the goodies one can find there: the luminous sun, the warm sand, the refreshing waves, and the clear blue sky. In fact, this bright fun look can be worn to a beach bonfire party and/or would be perfect for any other summer night out! Read along to find out how it's done! Prime your eyes and allow the primer to dry. 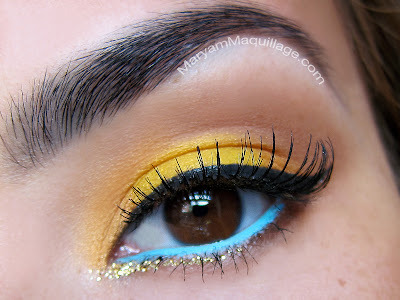 Using a flat eyeshadow brush and patting motions, apply the shimmery yellow (Goldfish) all over the center of your lid. With the same brush, apply a shimmery gold shadow (Eye Bronzer) to the inner and outer lid using the same technique. With a fluffy dome shaped brush and windshield wiper motions, apply a neutral matte shadow (Naked) to your crease, right above the gold and shimmery yellow blending out the edges. Deepen your crease with a slightly darker matte shadow (Buck) using the same technique and brush. Line the waterline using a white pencil liner (Ben Nye) and pat on a bright blue shadow (Parasol) directly on top, using a small dense brush. 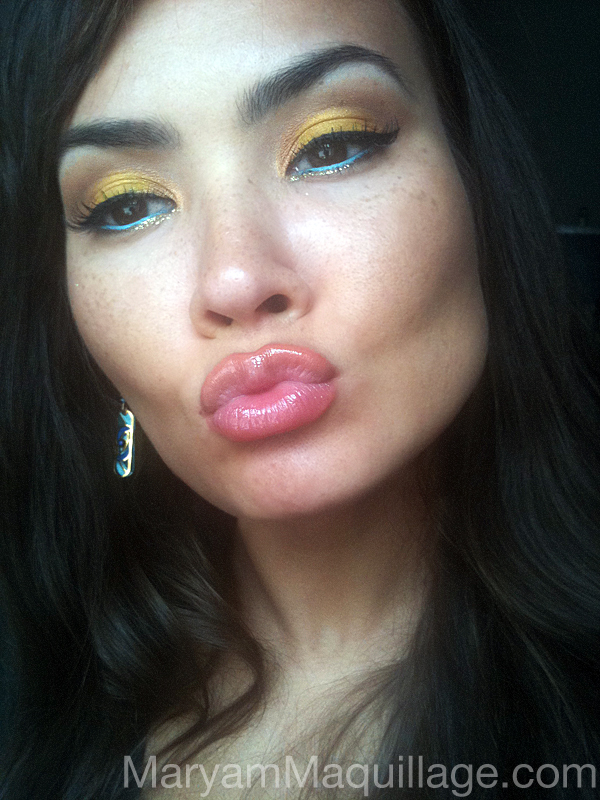 P. S. I got this cool tip from my girl Meredith Jessica :)) Check out her gorgeous sunset eye look here. Line the top lash line extending the wing using a black liquid liner (Revlon Shimmer Black) and sharpen the outer lower lash line with a brown pencil liner. Smudge out the lower lash line with your pinky. Highlight the inner lower lash line with a gold glitter liner (NYX Gold) and apply your lashes to complete the look. 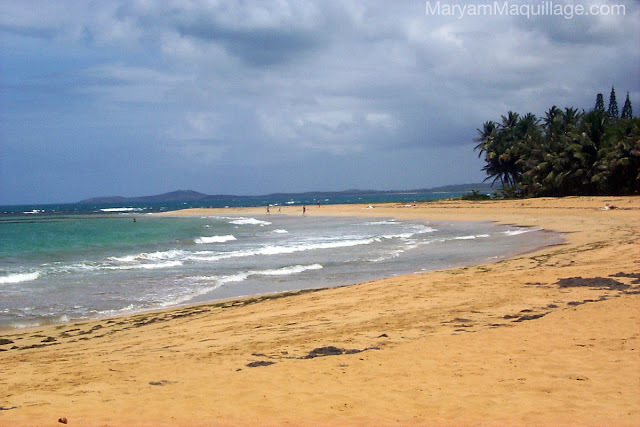 Hi Lia, I love PR, it's one of my favorite quick getaways :)) I've been there at east 4 times and I can't wait to go back again. Oh how I love the summer! Absolutely stunning and I swear I could die for your freckles. LOVE, LOVE,LOVE, LOVE! I love your interpretation of this look..you did perfect the colors are beautiful! Love it! Love it! Love it! Very pretty look! Gorgeous! Bright colours look really beautiful on you!!! Very pretty, I love yellow e/shadow. Beautifil! I love the yellow on you. aahhh maryam this is gorgeous! i love the bright blue liner! Nice post! If you have a minute, please check out my log and follow me if you liked it. I'll appreciate it so much! Thanks! Good Mornig Maryam! Oh that's make up is beautiful I love it! I LOVE how this looks on you! The yellow & blue really pop! The beach looks amazing!! Beautiful combination!!! I love the yellow eye shadow!!! Have a wonderful weekend, Maryam! Just like my swedish flag in blue and yellow. Will have to recreate this look! simply stunning! I would love to be on this beach! Amazing... Have a great week. Xoxo V.V. its like a sun! :) beautiful! This is beautiful!!! I love it!! You are really good with make-up! take care dear and hope you had amazing weekend! They looked amazing up close but then even more amazing far away - that yellow really does pop brightly like the sun in the bright blue sky - love that you take inspiration from the seasons. One picture can barely contain all the pretty! Which is why i'm glad you found a second!